Tornadoes can be incredibly devastating and terrifying. That’s why knowing how to act in the face of a tornado is crucial. Here are three signs that should tell you it’s time to take shelter. Hurricanes have caused untold damage throughout history. The force of a hurricane can devastate the entire east and gulf coasts of America. However, tornadoes can be even more deadly. While tornadoes aren’t as powerful as hurricanes in scope or scale, tornadoes can formulate quickly. Hurricanes offer advanced notice for citizens to move away from the coastlines and avoid the devastation. During natural disasters, it’s not uncommon for people to get caught in the midst of them because they didn’t want to “panic” and evacuate the area. Such indecision can have grave consequences when dealing with a tornado. Here are three signs that it’s time to take shelter. If the sky has a dark, greenish hue, it could be time to be on high alert. That is one of the first tell-tale signs of a tornado forming or approaching. In addition to sky color, if the clouds begin rotating, it may be a good idea to take shelter and wait for the sky to clear. A wall cloud—a formation of a cloud extending toward the ground—is another concerning sign that a tornado could be on the way. Wall clouds often rotate, but not always. They generally indicate an impending powerful thunderstorm at the least, so you should take the wall cloud as a clear sign it’s time to batten down the hatches. If you begin to experience large hail, often at the absence of rain, prepare yourself for a tornado. Updrafts—upward air currents—push rain droplets above the freezing level, which leads to hail. These powerful updrafts, and the resultant hail, are a good marker that there’s a high probability for a storm on the way. As mentioned before, tornadoes aren’t as powerful as hurricanes, but they are incredibly destructive in their own right. Tornadoes can reach sizes as great as a mile wide. Entire houses can get whisked away in the face of an F-5 tornado. And you’ll probably have fewer than 9 or 10 minutes to prepare before a tornado hits. 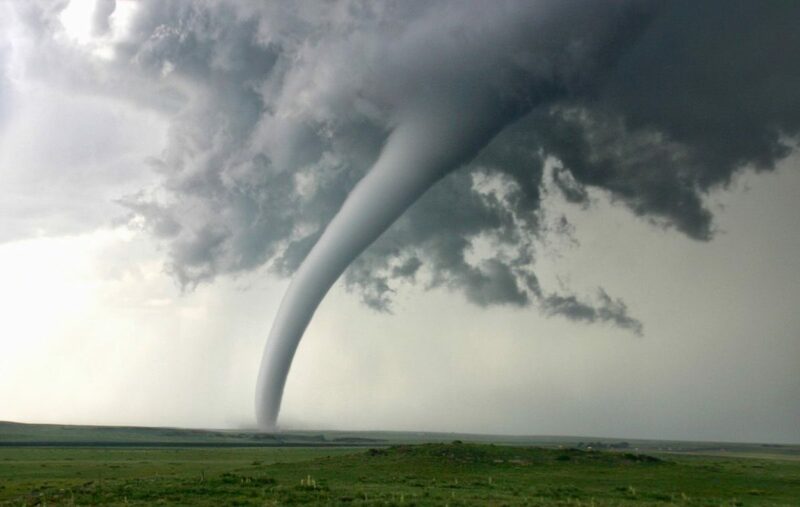 Tornadoes can also lull you into a false sense of security; sometimes the wind will die down and the air will get very still before a tornado comes. This can lead to the waste of precious minutes during the warning time frame. That’s why it’s important to be prepared ahead of time. If you don’t have a fully-supplied shelter, get away from the windows and put as many walls between yourself and the tornado. They can strike at any time, but the time for high alert is between 3 pm and 9 pm. Tornadoes move quickly, so they will normally pass through your area within a few minutes. But that short time can be terribly damaging and frightening. Make sure to take all the necessary precautions and heed the warning signs.